Mandu is a charming town situated in the Dhar district in the Malwa region of Madhya Pradesh. 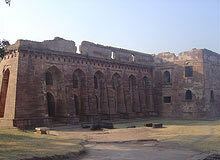 Encircled by the plateau of Malwa to the north and the valley of the Narmada River to the south, Mandu was originally the fort capital of the Parmar rulers of Malwa. The love of the Poet –Prince Baz Bahadur for his consort, Rani Roopmati still echoes in the ramparts of the majestic forts of this historic place. The life and the romance of these royal lovers is immortalized in folk songs and stories. Endowed with natural beauty and numerous historical monuments, Mandu was called as Shadiabad, meaning the city of joy by the then ruler Allauddin Khilji. Admiring the unrivalled tranquility of Mandu, Emporer Jahangir who travelled all the way from Delhi to stay here wrote “I Know of no place so pleasant in climate and as pretty in scenery as Mandu during the rains." What to buy – Handloom cloths, local handicrafts, silver and gold jwellery. Hindola Mahal or swinging palace was designed as an audience hall under the reign of Sultan Ghiyath Shah who ruled Mandu from 1469 till 1500. Built on a T shaped ground, the palace has derived its name from its sloping sidewalls. The walls of the palace are donned with glazed tiles and intricate floral motifs. The usage of superb and innovative techniques is evident enough in the delicate trelliswork in sand stone and beautifully molded columns of the Palace. 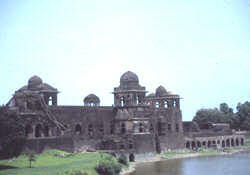 Built in the mid of the fifth century, Jahaz Mahal was built by Sultan Ghiyas-ud-din-Khilji to maintain his large Harem. The palace is stretched out on a narrow strip of land amidst two lakes, Munj Talao to the west and Kapur Talao to the east, that makes it looks like a ship. Situated on a hilltop, Hoshang Shah Tomb is considered as the first marble edifice and one of the finest examples of Afghan art and architecture in India. 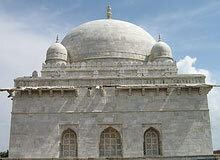 It was constructed in 15th century in the honor of Hoshang Shah who holds an important position in the history of India. It was from this tomb that Ustad Hamid got inspiration for designing Taj Mahal. The well-balanced domes and intricate marble latticework adorns the remarkable Hoshang Shah’s tomb. The magnificent Jami Masjid was built in 1454 in the afghan style of architecture. The mosque is crowned with huge dome and is surrounded by soaring minarets. The structure of Jami Masjid is similar to the grand mosque of Damascus. The wonderful arrangement of pillars, huge colonnades and the majestic arches of domes made Jami Masjid one of the finest achievements of the Ghauri dynasty. Asharfi Mahal meaning, palace of gold coins with open courts surrounded by cells served as an academic institution ((madarssa) for young buys. Mahmud Shah Khilji, the successor of Hoshang Shah, built this palace. The small cells of the Mahal are still in a wonderful state of preservation. Perching on a verdant hill, Rani Roopmati Pavilion was built by the poet-prince Baz Bahadur for his lovely queen, Roopmati. The pavilion standing next to Baz Bahadur’s palace portrays the remarkable expression of Afghan architectural style. Originally built as an army observatory, the pavilion offers a spectacular sun set view over the sparkling Narmada River. Rani Roopmati's pavilion gazes down at Baz Bahadur's palace and the holy Narmada. Constructed in the early 16th century, Baz Bahadur Palace shows an incredible mélange of Mughal and Rajasthani style of architecture.The Palace has spacious courtyard fringed with halls, and high terraces, which offer a breathtaking view of the town. Rewa Kund is a reservoir built by Sultan Baz Bahadur to supply holy water of Narmada to Rani Roopmati’s palace. It is the place where the romance of Rani Roopmati and Baz Bahadur bloomed. The water of this tank is believed to have medicinal powers. Nilkanth temple is dedicated to Lord Shiva who is also known as Neelkanth (blue-throated). The temple rests on the edge of a deep canyon. Hordes of devotees visit this shrine to worship Lord Shiva. The place offers a stunning sunset view. 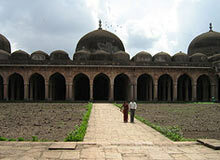 Close to Nilkanth temple is the Nilkanth Palace, which derives its name from the shrine itself. 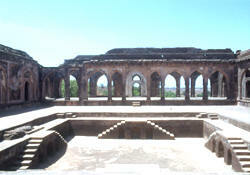 The Mughal Governor of Mandu, Shah Badgah, built this palace for Akbar's Hindu wife. The soaring walls of the palace are inscribed with the words of great Mughal Emporer Akbar that refer to the futility of earthly pomp and glory. Popularly referred as “Delphic Oracle” of Mandu, Echo Point is the one of the major tourist picnic spots here. Located next to a steep hill, the scenic place gets its name from the natural echo phenomenon here. By Air: Nearest airport is at Indore (99 km), connected with Mumbai, Delhi and Bhopal. By Rail: Nearest railheads are Ratlam (124 km) on the Mumbai-Delhi main line and Indore (99 km).